reading duties at Nottingham Elementary Scho. Embarking on a read-to-the-dog program with our Standard Poodle, I was filled with major anxieties. Jean-Luc, an only dog in a quiet household of two retirees, is overjoyed (read that “excessively excited”) when meeting other people and dogs. His enthusiastic entrances to the school library were dramatic; I often felt the unvoiced sympathy or perhaps disdain of the other dog handlers. But he did always settle down after a few minutes and a whole new world opened for both of us. I’d not been around young children much for a very long time and had forgotten how innocent and sweet are second, third, and fourth-graders. The reading program at Nottingham Elementary in Oxford, PA, was designed and is directed by librarian Kristina Johns with major help from assistant librarian Cindy Pugh. It is set up so that we work with the same six children for an entire school year. Those who’ve read to us over these five years have captured my heart. Some of them started out timid or even leery of such a big dog. A few were so empathique, I imagine them growing up to be dog trainers. A couple were so curious about teeth or toenails or behavior I think of them as future biologists or veterinarians. All, in the end, became captivated by the relationship. One of our readers was initially so frightened, I wondered if his parents had signed permission papers in order to help him with his reading or with his terror of dogs. Later that school year, I overheard him assuring some classmates that Jean-Luc would not bite. “How do you know?” they demanded. “Because I read to him!” he declared with authority. Another little boy, quieting Jean-Luc after an enthusiastic hello, wondered if they made pills for dogs like the pills he takes to calm down. Then there was play time. The program is set up so that each student reads to his or her dog for 20 minutes, and then has 10 minutes to play with the dog. The other dogs in the program would retrieve balls for their students. That was a problem for us. Jean-Luc does the RETRIEVING okay, but has never been stellar at the GIVING part. So here’s what we figured out to do instead. 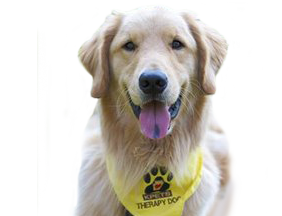 I give our readers seven tidbit treats each and help them learn treatable commands: SIT, STAY, COME, LIE DOWN, LEAVE IT, SHAKE, etc. Most of them even progress to loose-leash walking. Watching the delight of the children when Jean-Luc obeys them is, well, delightful. For some, this is the first time they’ve ever felt empowered; someone is actually listening to them. An amusing sidebar here is that Jean-Luc does not understand SET or LAY DOWN, so a few of our readers have learned a bit of grammar as well. And the books. Oh, there are so many new ones since I was last aware! One, in particular, made such a profound impression that I ordered a copy to have around the house. (Okay, I actually gave it to my husband for his birthday.) Dogs’ Night, by Meredith Hooper is an enchanting story on many levels. It takes place in an art museum where, one night every year, the dogs in the paintings may exit their paintings and run around the museum all night. On one particular night, they are delayed due to an evening party at the museum. In a hasty scramble to return to their paintings, some of them end up in the wrong paintings. During a class trip, a little girl notices the mix-up and then the fun begins! Well-known paintings from the London National Gallery are featured in the book. Children reading this book are quietly introduced to art as something interesting and pleasurable. Cool! I’m not sure how much longer Jean-Luc will be able to continue. He’s becoming more and more grumpy about the slippery, shiny floors. And riding in cars has never been a thing he likes. I’ll miss this engagement when we finally have to retire. Whatever benefit it has been to others, I can only surmise. What I do know is that for me it has brought unexpected, immense pleasure.